April 10, 2015. KDE today announces the release of KDE Frameworks 5.9.0. Note that Plasma-NM 5.2.x needs a patch in order to build and work with this version of ModemManagerQt. plasma-nm patch. Alternatively, upgrade to Plasma-NM 5.3 Beta when upgrading to ModemManagerQt 5.9.0. Fix assert when using KSharedConfig in a global object destructor. kconfig_compiler: add support for CategoryLoggingName in *.kcfgc files, to generate qCDebug(category) calls. KDescendantsProxyModel: Handle moves reported by the source model. KDescendantsProxyModel: Fix behavior when a selection is made while resetting. KDescendantsProxyModel: Allow constructing and using KSelectionProxyModel from QML. KWindowSystem::icon with NETWinInfo not bound to platform X11. Extra CMake Modules (ECM) is now versioned like KDE Frameworks, therefore it is now 5.9, while it was 1.8 previously. Many frameworks have been fixed to be useable without searching for their private dependencies. I.e. applications looking up a framework only need its public dependencies, not the private ones. 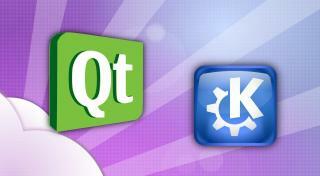 The complete source code for KDE Frameworks 5.9.0 may be freely downloaded. Instructions on compiling and installing KDE Frameworks 5.9.0 are available from the KDE Frameworks 5.9.0 Info Page. Building from source is possible using the basic cmake . ; make; make install commands. For a single Tier 1 framework, this is often the easiest solution. People interested in contributing to frameworks or tracking progress in development of the entire set are encouraged to use kdesrc-build. Frameworks 5.9.0 requires Qt 5.2.